Happy Sunday to you! Today I have a special treat just for you and well, my belly too! I made one of the ultimate peanut butter cookies ever! You have sweet, chewy, soft all rolled into one cookie. 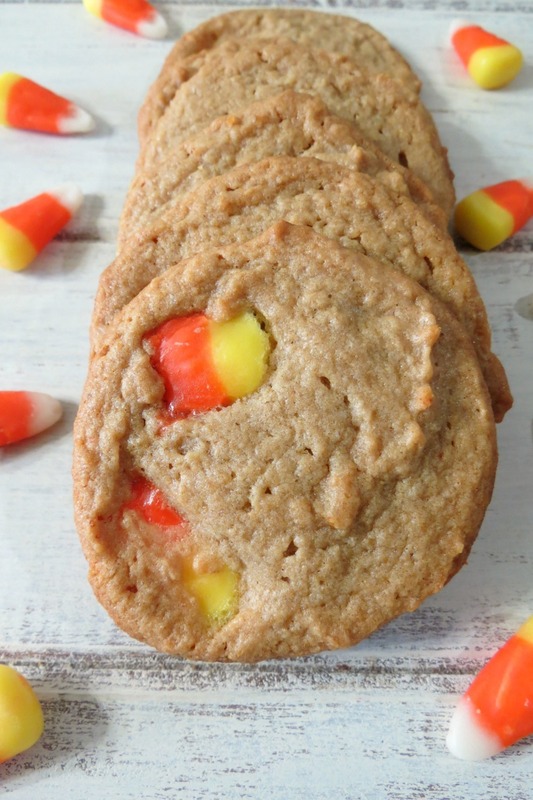 Not to mention these are the perfect Fall Peanut Butter Cookie because they are made with one of my favorite Fall candies, Candy Corn!! Oh baby these are so good! 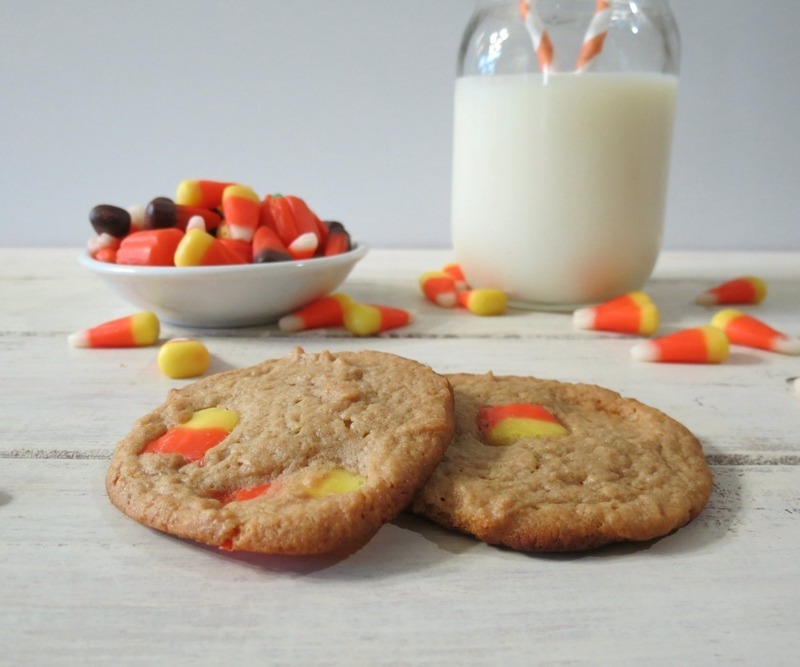 So sit back, get ready to plan, because you must make these cookies today!!! I have to tell you I had fun taking photos of these cookies. I don’t know what it is, but there is something fun about candy corn. I think besides the honey flavor, I like how cute they are. You have to admit they are adorable little candies and they are fat-free!! Yes, I know they are mostly sugar, but sometimes you just need a treat and these are my Fall treats for me. A lot of people go for traditional Halloween candies, but not me, I’d rather have a few of these bad boys! You know how much I love peanut butter and I thought I would change-up the traditional peanut butter cookies and use Peanut Butter and Co White Chocolate Wonderland Peanut Butter. Oh man is that PB delish!! I needed to use it for something because I thing I would just sit there with a big spoon and eat it. If you don’t have Peanut Butter and Co White Chocolate Wonderland PB, regular creamy peanut butter will work just fine in this recipe! 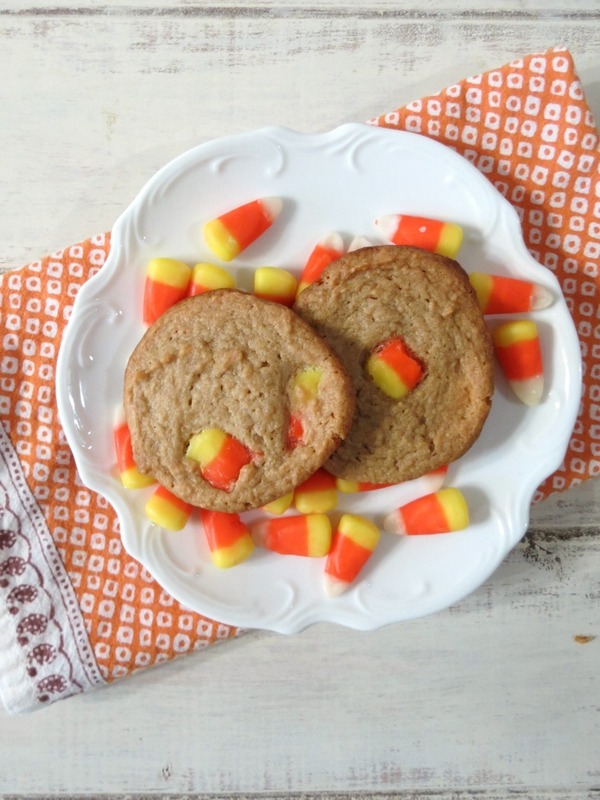 The cookies are really easy to make and there is no refrigeration required. I tend to hate making cookies that need to be refrigerated. When I start a recipe, I want to finish it, no waiting. I just don’t have patience for that! But one thing to note is the batter is very soft. But trust me on this one, this will make a nice flat, cookie that is oh so perfect!! No need to make fork marks in the cookie or roll the dough. Just scoop and bake! You have to love that! The recipe took me about 10 minutes to make and 8 minutes to bake. 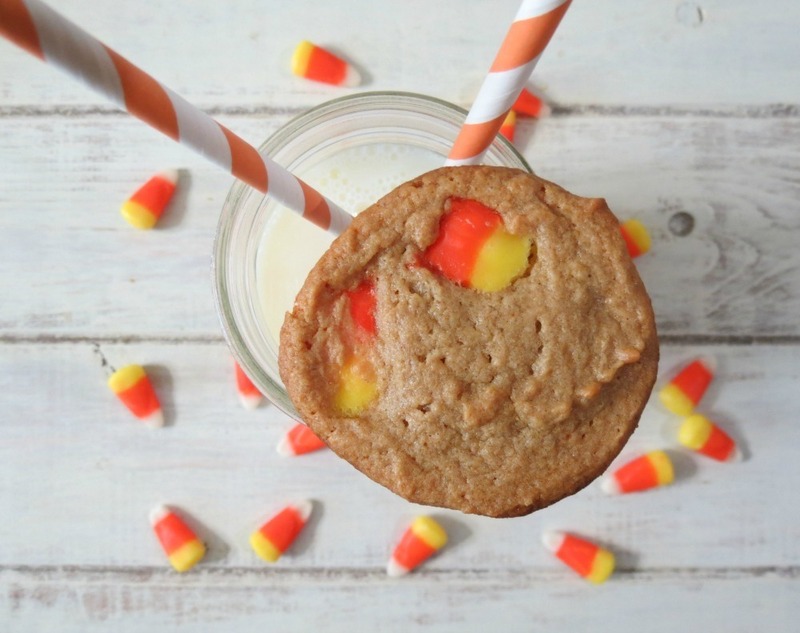 In less than 30 minutes you will have this chewy sweet Fall cookie. I can guarantee that these cookies will be a sure hit with friends and family. Oh and yourself! I gave some to Jenny and she just Loved them!! My Husband on the other hand he’s not a PB fan nor a candy corn fan so these cookies are for the girls in the house. I don’t see any problem with that!! 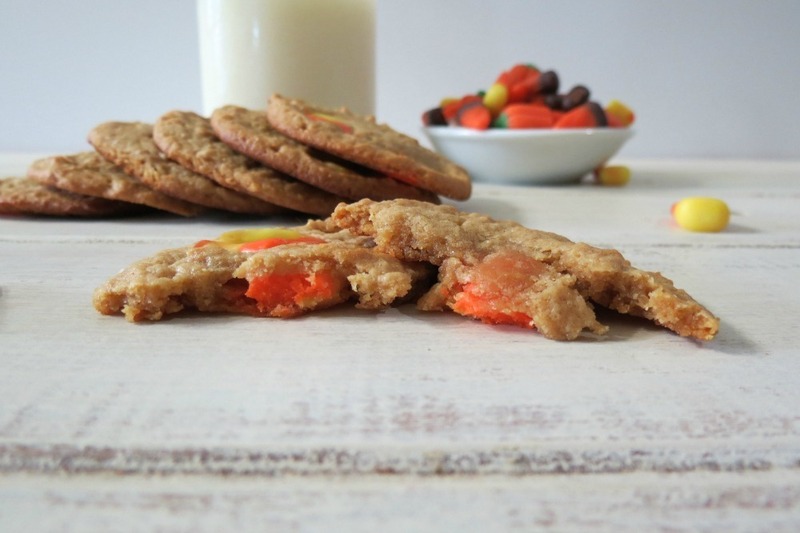 A sweet, chewy peanut butter cookie chock full of candy corn. In a medium bowl, add flour, baking soda and salt; stir well; set aside. In a large mixing bowl, add brown sugar, granulated sugar, peanut butter, butter, and vanilla extract. Beat until combined. Add the egg and beat until blended. Gradually add in the flour mixture and mix until just combined. Fold in the candy corn. Bake for 8 minutes or until the bottom of cookie is lightly brown. Let cookies cool on baking sheet for two minutes and place onto cooling rack. Be warned their are two things I need to tell you about these cookies! One you need a big glass of milk to go with it!! The cookies are sweet! Two, they will not last!! You may want to make a double batch. I made these cookies and within an hour half of them were gone. I don’t think they will make it to work tomorrow! I had a lot of fun with today’s recipe! That’s the one thing I love and hate about blogging. Coming up with new, fun recipes is great! But I don’t like how tasty they are because I can’t control myself eating them. 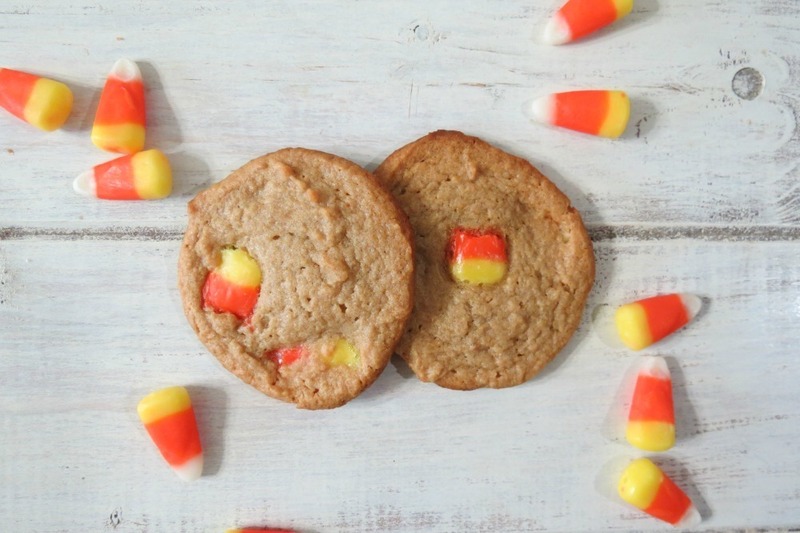 They may be pretty low in calories for a cookie, but when you eat more that two, I know I will have to make an extra effort at the gym, however these cookies are worth it!! Well my Friends! I have a fun and exciting week stored for you starting tomorrow! I already wrote 3 of my posts in advance and I can’t wait to share them with you! Have a fabulous, warm, cozy Sunday! Now get in that kitchen and bake some cookies! Be sure to send some my way! OH my gosh!!! These are genius! I need to make some like this soon! Thanks Sophia! They are so good!!! 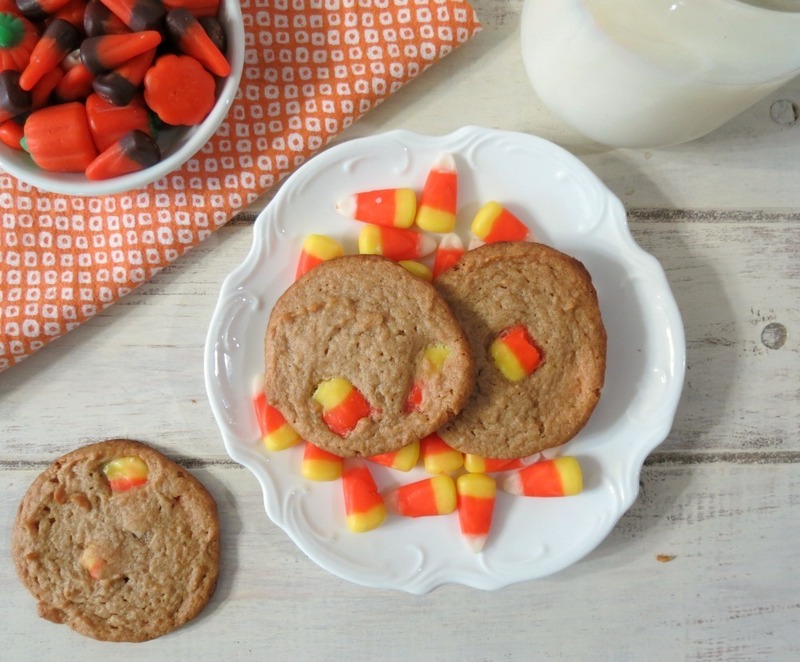 Never thought candy corn and peanut butter go together, but they do!! These are awesome. I have to make these. My daughter in law is having twin boys tomorrow. I am making these tonight. I can’t sit still another minute. You should link tongue to What’d You Do Tis Weekend. I hate auto correct and typing on my iPad. “You should link these…” Ugh! OMG! 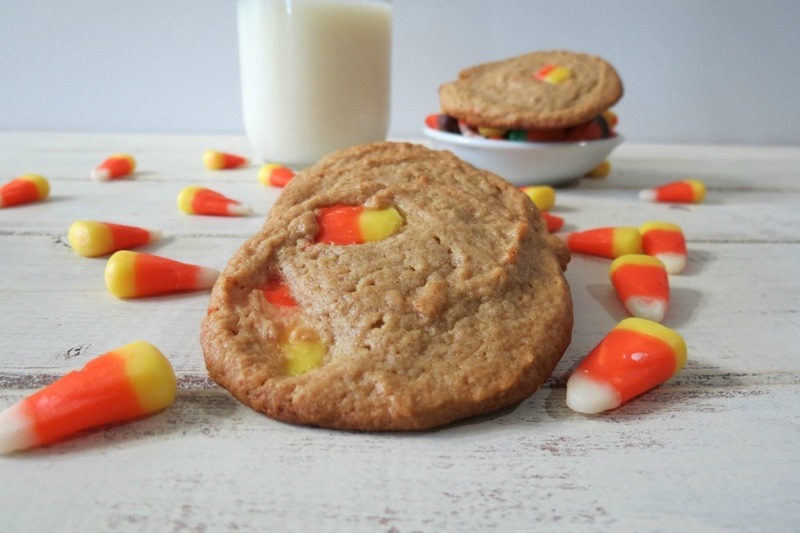 Biscoff would be amazing as these cookies! Great idea! We are going to peanut butter and peppers.